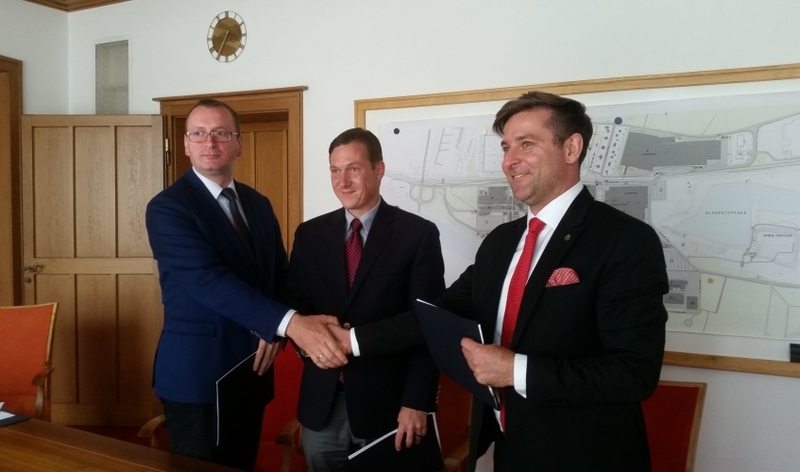 The City of Lublin, URSUS S.A., and TUM International GmbH representing the Technical University of Munich will establish The Smart Industry Centre in Lublin. On July 12, 2017, at the premises of the Industrie Center Obernburg in Bavaria, the trilateral agreement was signed on the implementation of the Project Preparation Phase. The agreement was signed as the result of the activities of The City of Lublin and talks conducted by URSUS S.A. during this year's edition of the Hannover Messe. As early as November 2016, the Managing Director of TUM International GmbH, Daniel A. Gottschald, paid a visit to Lublin, where he met representatives of the City Hall, Lublin University of Technology, Lublin Science and Technology Park and URSUS S.A. The purpose of the initiated partnership is to establish The Smart Industry Centre - integrated industrial park in the area of about 140 hectares, which will help the city lure both domestic and foreign investors representing the key sectors of the local economy and create common ground for cooperation with local suppliers. This project is directly linked to the program of revitalization of post-industrial areas of the former Lorry Factory in Lublin, the expansion of Special Economic Zone Euro-Park Mielec Lublin Subzone to the area of former Daewoo Factory, as well as with the development of the URSUS S.A. company and the construction of its new production plant. The Smart Industry Centre, likewise Lublin Automotive & Machinery Cluster - which will be established soon - are the elements of currently created 'Lublin Automotive & Machinery Upland' ecosystem, that will increase the competitiveness of Lublin industry. The Smart Industry Centre is the next step of the City of Lublin in the implementation of the Lublin Development Strategy 2013-2020. The success of the SEZ Lublin Subzone, which has its 10th anniversary this year, shows that our city has the potential to become the future-oriented industry 4.0 centre. It is also proven by the decision of locating in Lublin the Centre for Electromobility and successes of innovative companies from Lublin from the smallest enterprises like the Nexbio startup to the biggest, worldwide renown companies like URSUS S.A. I am sure that particular orientation of the urban economy on modern, intelligent industry, which heart will be the traditional industrial area of the former Lorry Factory, will allow us to reach the development level of such cities as Wrocław and Poznań in 2025 - says Mariusz Sagan, Head of the Strategy and Investor Relations Department in the City of Lublin, who signed the agreement on behalf of the City of Lublin. The integral element of the project is to develop technological cooperation between the companies from Lublin with the Technical University of Munich, which is one of the world leading centres of electromobility research and the introduction of 4.0 industry standards. The Bavarian party was represented by TUM International GmbH, a global competence centre for the development of industrial areas and the transfer of technologies, which constantly cooperates with, e.g., SIEMENS AG and Evonik.